This spring I decided to try something new, totally inspired by a fabric. The thing is I don’t usually wear florals. Not sure why but my eye always goes to stripes and polka dots but never anything that is flowery. This print, a lovely lily design on a navy background, however changed that. Every time I walked by the bolt in my almost daily visits to the Fabricville down the street, I would find myself handling this fabric and wondering what I could make out of it. This decision led me to a second new direction – an attempt to “mash” two patterns together – Jalie’s empire waist knit dress and this sport top with the shawl/folded neckline that had become my favourite. Recently I have been rediscovering some of Jalie’s classics and have found out that they really can be used in so many ways as TNT (tried and true) patterns with true creative possibilities. Combining these two patterns was easy. 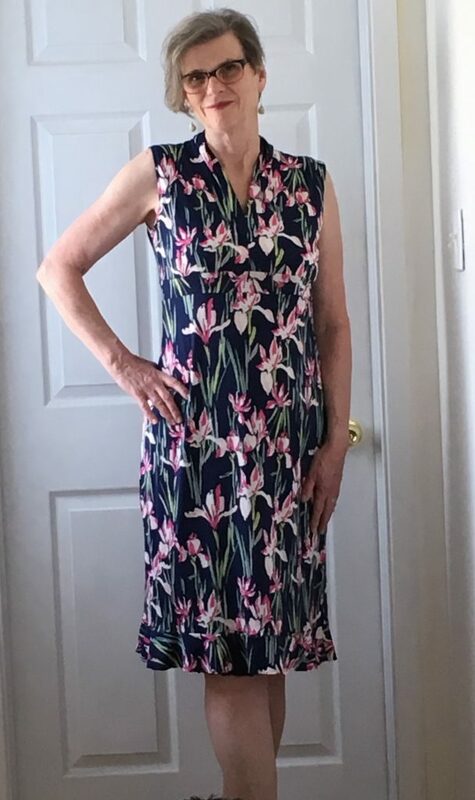 The top pattern has a seam just under the bust and this made substituting the upper portion for the cap sleeve boat neck of one version of the knit dress very simple – the seams turned out to be the same length! I was really happy with how this mid weight knit really draped nicely around the neck and how the skirt hung from the princess seam without clingy ( pattern note the skirt is not as body forming as the pattern envelope picture suggests – no shape wear necessary here). You can really see the ease in the skirt in this shot, taken with my photographic assistance in the picture. The next decision I had to make was whether or not to finish the dress with the flounce included in the view of the dress. I have never actually used a flounce on a skirt hem before and I was really hesitant about this. 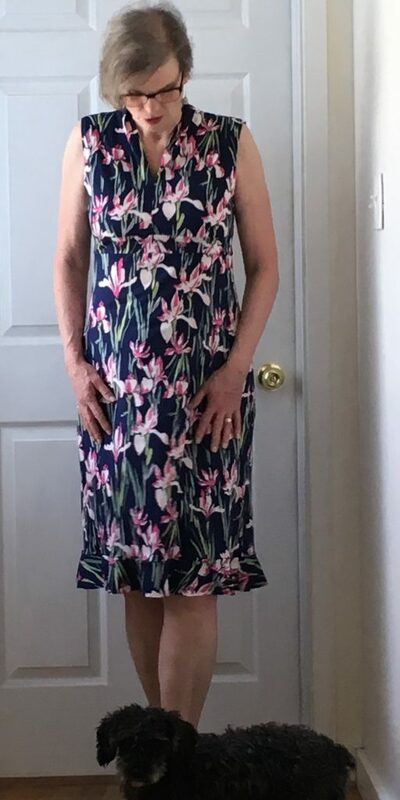 I was afraid as a tall woman this would look too frou-frou on me, but since I had already done two new-to-me things with this dress – a pattern mash-up and a used a floral fabric – I figured why not? I love this dress. 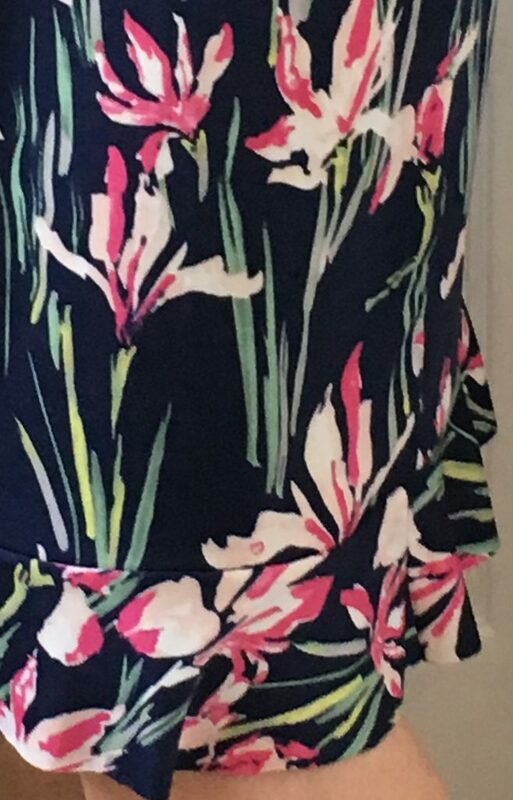 Combining the two patterns was a piece of cake and I definitely feel feminine and spring like in this dress. More importantly I have learned to sew more bravely and that feels like a great way to start a new season. Very nice. I like how the vertical stems of the flowers add to the slim shape. You did a wonderful job mashing the two patterns.